The information provided in this reserve parachute guide is to the best of our knowledge. Always follow the manufacturer’s advice and check the manuals. If in doubt seek out an expert! Buying a reserve parachute (rescue) can be a complicated decision. A reserve can seem like an unnecessary cost, something you could do without or don’t need to pay much attention to. You’re probably in a safe environment while reading this, so it’s hard to have a clear perspective because your life is not at risk. You might consider that any old reserve is good enough. You might even consider flying without one. Try a simple thought experiment: you’re soaring late in the afternoon. A pilot blinded by the sun veers into your path and stuffs his boots through your lines. Your wing balls up around him, his wing dives, and you’re falling. Right, can we start the discussion on reserve parachutes again? Having a reserve parachute is a cornerstone of reducing risk. If you correct aspects of your gear that introduce unnecessary risk, your safety is affected by fewer variables. 1. We all make mistakes. If you find yourself in a flight situation which is not recoverable in time, you need a reserve. 2. Weather conditions can change. If you’re caught in uncontrollable turbulence, you need a reserve. 3. We seldom have the sky to ourselves. If you are involved in a mid-air collision with another pilot, a large bird or a drone, you need a reserve. 4. Equipment can fail. There are many components you are trusting your life to, and all suffer from mechanical stress, manufacturing variations, and ageing. If just one maillon, riser or karabiner breaks, you need a reserve. 5. Having a reserve can reduce fear levels during turbulence, allowing you to focus more clearly on piloting. Although there are technical differences between modern reserves, all styles work. But not all reserve parachutes are created equal! From our experience, their build-quality, design, materials and effectiveness can vary significantly. We recommend sticking with the brands we trust that have a proven track record. Choosing the right type from within this selection depends on your needs as a pilot. A simple design that works if it’s big enough to give a decent descent. This is the ‘traditional’ tried and trusted design, and is the most affordable option. Pay particular attention to the size (area in m²) as one of the main factors which determines the ‘sink rate’ of a reserve is the load per square metre. A mid-priced option that uses a square design with corner vents to offer the same descent rate (in a certification test) from a smaller canopy and thus a more compact package. It achieves increased pendular stability and lift generation by tracking sideways, but you have no control over the direction. Sometimes this glide could be useful, sometimes not: for an unplanned deployment it’s no worse than a PDA which will drop you on whatever happens to be beneath you. However, if you’re doing SIV/acro over a safe landing zone, you need more space because you can’t reasonably estimate where you’ll track to under a square reserve, and you’ll track even further if you disconnect (or pull in) your paraglider. The lightest version of the square (Independence Ultra Cross) provides an incredibly small package, at a price. The Companion SQR incorporates features of the PDA and Cruciform styles combined with other design innovations to offer a ‘best of the class’ approach in the non-steerable category. Due to the stepped skirt and packing technique, it has a fast opening. The channels for air to escape help provide extra pendular stability, but it is not designed to glide. This reduces the risk of mirror-effect when compared to squares or rogallos. Certification tests show only what reserves do with no paraglider attached to the pilot. The design team used their experience and real-life testing to optimise the behaviour so that it deploys reliably in various situations and resists the interference of the paraglider with the least impact on the sink rate. Overall it presents the lowest demands on the pilot, with the simplest operation. After having thrown a non-steerable reserve and contemplated the many horrors below, pilots often decide to buy the rogallo. Many acro and test pilots swear by them, because if you deploy high enough and control or cutaway the main, you can choose where you land. They offer the best descent rate (due to having an aerofoil), fastest opening speed and the most landing options due to being steerable. All reserves present a risk of down-planing if you do not disable the paraglider. Some rogallos have an increased risk of down-planing due to their gliding tendency, but this is mitigated by having a very large surface area that deploys in a slowed state (High Adventure Beamer 3). If you can get control of your main paraglider (B-stall, C-stall, wrapped brakes or pulled in wing) it is not necessary to cut-away, but you can do so if your harness is equipped with quick-out karabiners and speedbar pins (or a hook knife). That produces increased gliding ability, removes twists and reduces the risk of the wing tangling with the reserve. You can steer yourself into clear airflow and land into wind, reducing ground speed and landing impact. 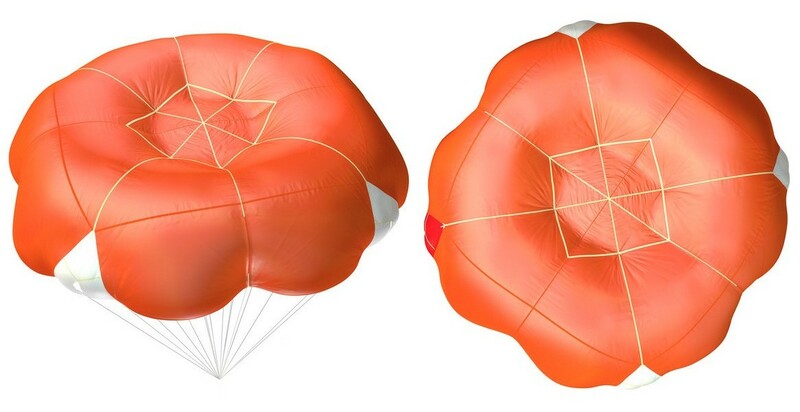 A cut-away system designed for acro professionals, the deployment releases your main glider and uses it to pull out a standard steerable parachute, giving you complete freedom to reach a safe landing zone. Cons: expensive, heavy dedicated harness, very complicated to pack, requires 100 m minimum height above any obstacle to be considered safe, will not work if you are tangled in your wing, you must remove your hands from controls when jettisoning, could open facing the hill or significantly increase downwind landing speed (but can steer), due to limitations requires a second reserve, and … you might lose your main wing! The ideal size for you is primarily dictated by your all up flying weight (including the reserve parachute). Just like wings, reserve parachutes have weight ranges. The more weight you load it with the faster you come down. As well as a high sink rate, an overloaded reserve also has a higher risk of down-planing and oscillations. So it’s important to look at various brands and styles to make sure you’re choosing one where you’re in a good place in the weight range. It’s not recommended to have a higher sink rate than 5.5m/s as the chance of injury on landing is high. This is the limit for certification under the EN 12491 system. Many pilots have a reserve that is too small. This happens because smaller sizes are usually cheaper and lighter. However, once you’ve seen a pilot deploying a small reserve you’ll want to get rid of it (even cheaply), and so the cycle continues. Don’t be part of the problem, get a big reserve to start with! Opening speed is the argument often quoted to support smaller reserves, but the time to reach stabilised descent can be much longer due to the down-planing problem that a small reserve creates. Real life opening speeds vary greatly from the controlled drop test shown in EN reports. The design and packing can influence the reliability much more than size. A reserve should not be too large, as this might cause oscillation problems. For this reason manufacturers usually quote a weight range, although this is not part of the certification testing. Note that sink rates quoted on certification tests are in perfectly still air after disconnecting the paraglider using quick outs, which very few pilots are equipped to do. Your real sink rate might be higher if your wing causes oscillations or down-planing or you’re in sinking or turbulent air. Your attached (stalled) paraglider also slows any ‘gliding’ style reserve (square, rogallo) so might increase your sink rate. Your sink rate might be lower if you have gained control of your flailing wing and it is assisting the PDA or SQR reserve. 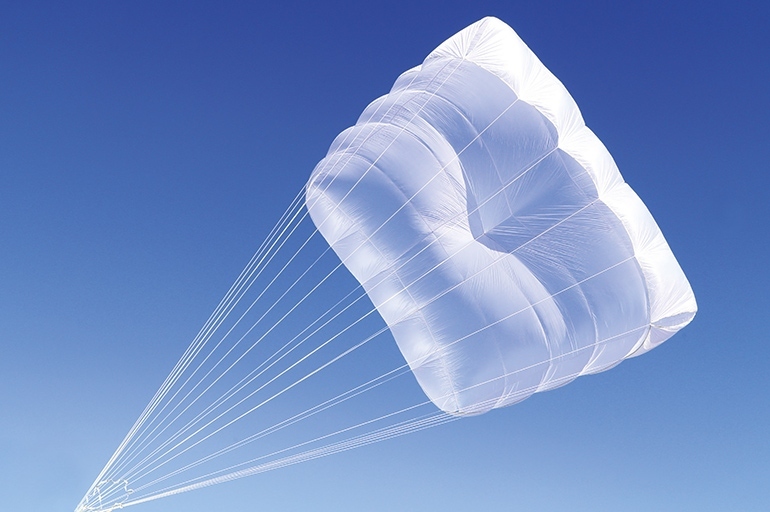 Most manufacturers recommend replacing a reserve parachute after 10 years. So their price on the second hand market decreases on a straight line towards this point. We won’t sell reserves older than the manufacturer’s recommended lifetime, and if you are considering such a reserve be sure that it first has a full inspection by a service centre like The Loft. High Adventure certifies their Beamer 3 for 14 years assuming it has inspections every 12 months, but warn that the life depends very much on the style of use and quality of care (deployments can significantly reduce the reserve’s life). The reserve usually terminates in a short riser loop. This needs to be connected to the harness using maillons and a reserve bridle (both of which you might have to purchase separately). For the single connection point at the base of the reserve riser, we recommend a Peguet Maillon Rapide Square Stainless Steel 7.0mm (or one of the appropriate shape, see below). Please be careful of cheap copy products which have questionable strength. For the two attachment points on the harness, use Peguet Maillon Rapide Square Stainless Steel 6.0mm (or one of the appropriate shape, see below). This is based on recommended industry standards and allows for manufacturing variations and ageing. For tandem flying or more peace of mind, increase maillon size by 1mm. Measure the width of the webbing on both sides of each connection to ensure you get the right style of maillon. For normal wide webbing to wide webbing: square maillon. Wide to narrow: delta maillon. Narrow to narrow: standard (oval) maillons. Extra wide to wide: trapeze. We have stock of all of these maillons so that the most suitable maillon can be used. Alternatively, suitable soft links can be used at all points. Using 40mm O rings, a maillon cover or rubber bands, fix the maillons so that they cannot rotate from their strongest position (lengthwise loading). The maillon should be properly screwed shut to avoid any possibility of it opening accidentally. Finger tight is generally not enough to be sure they won’t open over time. Tighten a little using pliers but be careful not to over-tighten as this could damage the thread and greatly weaken the maillon! These come in various lengths, usually an inverted Y shape. Sometimes they are sewn in as part of the harness, in which case the existing webbing to webbing connections on the shoulder points are suitable. If you only have the attachment points but no bridle on your harness, you need to choose one. Reserve bridles come in different lengths, which affects the pendular stability of the reserve, so it’s best to match the brand of your bridle with the reserve or choose one of similar specifications. It should also be compatible with your harness. The bridle should be attached to both harness shoulder strap loops, not just one of them. Most reserves come with a short webbing ‘strop’ connecting the lines together. Steerable reserves have two long bridles; some older non-steerable designs have long Y bridles sewn in. Do not attach them to a harness reserve bridle as the total length will be too long – connect directly to the shoulder points or main hang points. Steerable reserves also require short extenders (for optimal steering) when connected on the main hang points. Some harnesses (usually the ultralight ones) don’t come with shoulder attachment points for the reserve bridles. It is unsafe to connect a reserve onto the shoulders if the harness doesn’t have specially reinforced support loops there! Use the main hang points instead. You could simply loop the bridles onto the main karabiners, but this offers no safety should your karabiner fail. Dedicated soft links can be run through the main attachment points to connect the reserve bridle instead. If you connect the reserve bridle without using a maillon (by passing it through the loop and itself, then pulling tight) you have a webbing-to-webbing connection, and there is a risk of shearing due to heat from friction during shock deployments. This can be mitigated if the attachment points are designed to withstand heat shear, if the same material is used on both sides, and if the connection is secured in position, but most manufacturers recommend connecting reserves using only maillons or soft links. * soft links not strictly necessary, but provides safety in case of main karabiner failure. Most harnesses integrate the reserve parachute pouch under the seat. 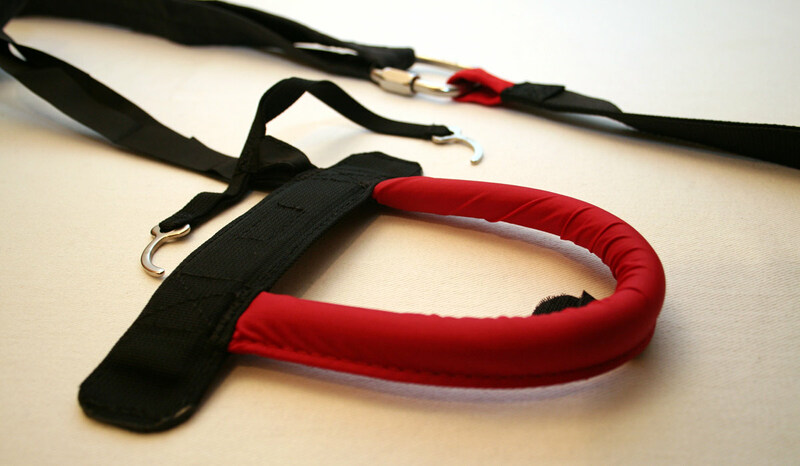 Some harnesses integrate the reserve pouch in the rear or side of the harness. Others have a chest-mounted reserve pouch. 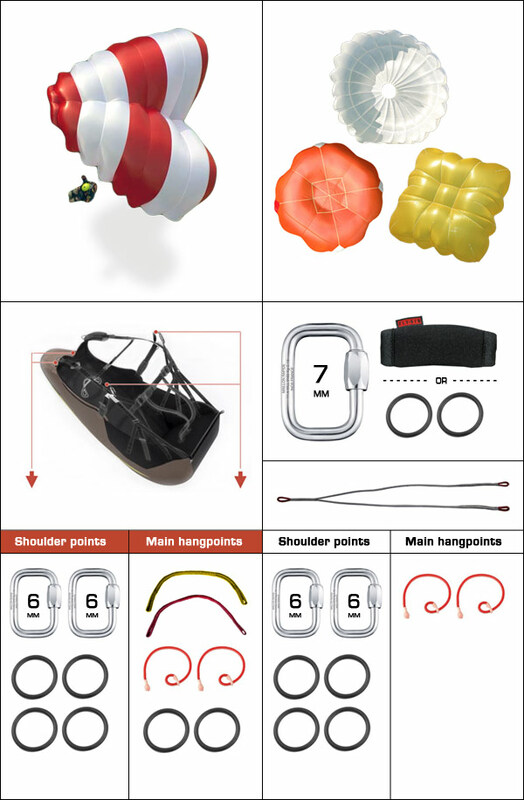 A few harnesses like school training or ultralight harnesses have no integrated reserve pouch, but you can purchase a reserve outer container which attaches to the chest strap. This is a great position for a reserve parachute that allows easy deployment with either hand, is always visible so is checked more often, and does not compress under the weight of the pilot in high G manoeuvres. If you run the bridles up to shoulder point attachments you might need a bridle cover. This is the weak point in all reserve systems, as noted in some repack clinics where up to 50% of deployments have shown up issues or failed. To avoid any fitting and assembly errors which could lead to a failed reserve deployment we strongly recommend that should you have your reserve fitted by a suitably qualified or experienced person. Make sure you take the time to read the reserve and harness manuals thoroughly and watch how-to videos and recommended best practices. Compatibility checks are part of our reserve buying and fitting, included as part of the service to customers who buy their reserve or harness from us. Check your pins, and make sure the release is smooth and the reserve bridle pulls out fully from its gusset. If you didn’t install it yourself, take a few photos of the process so you can be sure to get the installation right. Do a proper hang check (suspend your harness from a tree/frame, get in) and do a test deployment. This helps you become familiar with the angle of forces and mechanics of deploying. This should always be done with a freshly packed reserve as they bulk up during repacking. It should never be a tight fit, as during a spiral the G forces will push the pilot down into his seat and further compress the reserve pouch. If in doubt, seek expert advice! Make sure yours is freshly packed, at least once a year. Grit collects in the reserve parachute (causing damage through abrasion). Damp from ballast and wet grass can seep into the reserve (causing mildew and hampering opening time). The fabric gets compressed which delays opening. Packing elastics can perish, badly packed reserves can slide out of nappies, loops can tangle, and pins can get damaged. All materials degrade with age, even when not used. Although you can repack one yourself following the manufacturer’s instructions, we recommend using a professional service to ensure it’s done right and that the canopy gets a thorough inspection on a light table (at least every 2 years). Steerable reserves are more complicated to pack. 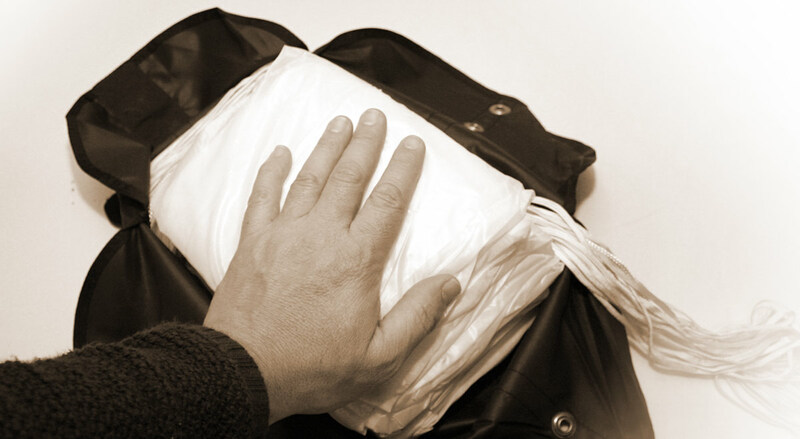 We don’t offer a reserve repacking service but BHPA licensed repackers like The Loft and Aerofix do. Also look out for ‘Big Fat Repack’ reserve clinics, run by BHPA clubs, which offer a unique opportunity to slide down a zip wire (or swing on a rope) and have a realistic deployment before packing (under guidance). • Do not leave the reserve out in the sun (UV radiation) unnecessarily. • A wet or damp reserve should be completely unpacked and allowed to dry inside at room temperature, or outside in the shade. • Do not expose a packed reserve to large temperature changes, and do make sure it gets enough air circulation in cars and building so that condensation does not form. • Deal with the reserve carefully on the ground after an opening, or during SIV training. • After contact with seawater the reserve must be thoroughly rinsed with fresh water. • Only clean the reserve with fresh water, and a little neutral soap if required. Never use solvents. Chemicals, cleaning agents, insects, stains etc. can affect the strength of the parts as much as physical abuse. Choosing the right model depends on your priorities, your gear and your budget. Factors to consider: harness compatibility (does it fit into the reserve pouch and can I get it out again? ), certification (must be EN 12491), opening time (mostly about 3-4 seconds), descent rate (at max load, your all-up flying weight), stability (pendulum resistance, and down-planing), steering, ease of use, build quality, price, system weight, packing (complexity, cost, availability of packers) and age. Make sure you are comparing the same kinds of reserves when comparing sizes (e.g. a PDA round reserve to another PDA round reserve). If you need help, contact us. First we find out the pilot’s all-up weight and reserve buying priorities and explain the pros and cons of each type of reserve (based on our knowledge). Then we sort and filter the list by maximum load to narrow down the choices. We continue to filter down the choices based on your buying priorities. This works really well, and the results, based on real examples, are sometimes surprising. In practice we have found that, whilst certain reserve models tend to mostly come out tops, this changes with time (new reserves appear, prices change) and it also varies quite a bit based on the pilot’s all-up weight and their buying priorities. We offer our reserve buying advice and fitting service free of charge to customers who buy their reserve from us. A common error: that maillon needs securing on both sides! This is usually caused by a reserve that is too small, or a diving paraglider with twisted lines, which prevents control. 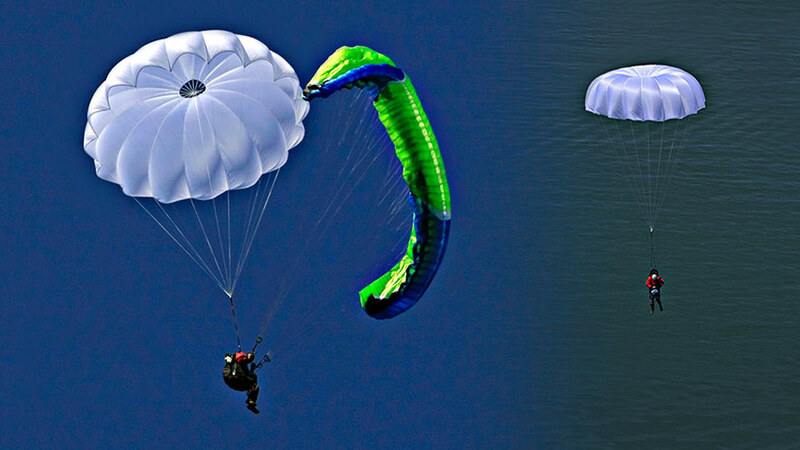 After deployment, the reserve pulls backwards on the pilot’s shoulders, and the paraglider pitches forwards, entering a stable dive due to the balance of forces. This high sink rate combined with the pilot’s body position creates a catastrophic landing. It is surprising how much force is required to disable a down-planing wing, and how wings that are in a mess will still down-plane. The solution? 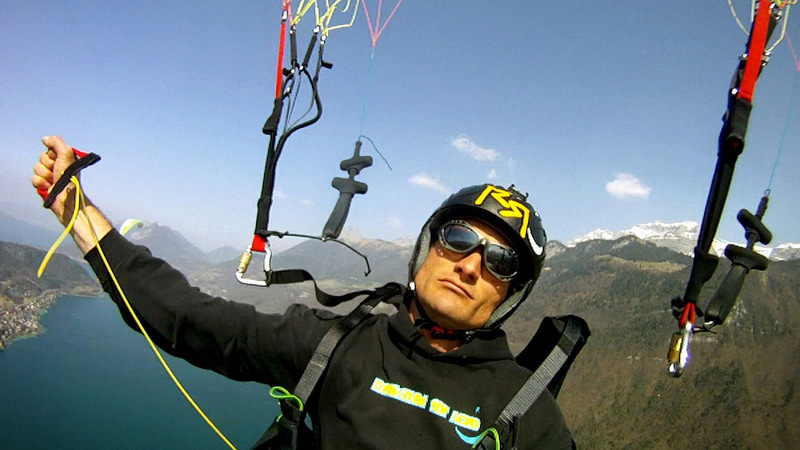 Cut through the paraglider risers or lines with a hook knife (or use quick out karabiners). To improve your chances, get a reserve that is large enough, with a low sink rate. Or consider a second reserve. This usually refers to wing against non-wing based reserve (e.g. round, PDA or cross), but could also occur between wings (including Rogallo or Ram-air reserves), where the wing is off to one side and the reserve to the other, causing the reserve to be far less effective resulting in a higher descent rate. In contrast, down-planing involves a dive and usually requires “wing against wing” (including Rogallo or Ram-air reserves) i.e. aerofoils flying and pulling against each other, causing downward acceleration. Do I need a second reserve? Most acro, competition and test pilots carry two. Reserve deployments can be extreme situations with unpredictable consequences. After many bad experiences, the CIVL decided to make carrying a second reserve a requirement at high level competitions. Apart from resolving failed deployments and tangled wings, throwing a second reserve is likely to remove a downplane situation. 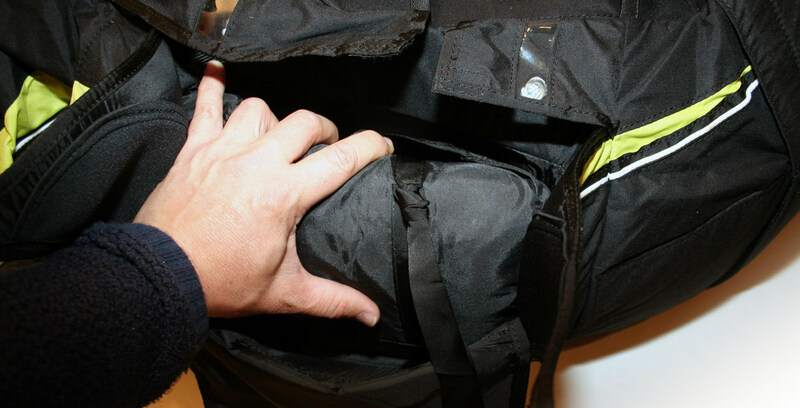 The inner deployment bag and the handle are often lost during a deployment. They are designed to do this. 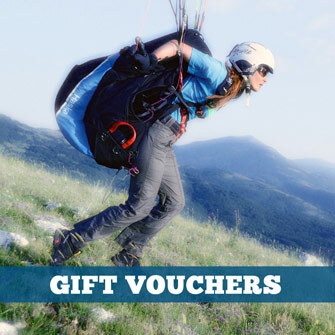 Don’t try attaching them with string, because this creates a lethal flailing tail that can wrap around the reserve and prevent opening, or snag on the paraglider and foul up the reserve. If your handle is missing, buy the original replacement part as designed by the manufacturer, which has all the right lengths of pins and fasteners, particularly the right length of strop. Many pilots buy a spare reserve handle for trips and SIV courses. What is Breaking Load (BL) and Working Load Limit (WLL)?